You have a big golf game coming up but there’s no golf course nearby to practice and perfect your technique. What do you do when you have to work on minimizing your strokes or work on your putt shots? Well, you could always use a golf hitting mat. Golf hitting mats are designed for people who can’t afford the luxury of always going to the golf course to practice. The hitting mat simulates theexperience of an actual mini golf course which aids you in practicing your stance, aim, putt and strikes. If you’re looking for the best practice golf mats on the market at the moment, look no further as we’ve compiled a top 10 list for you. 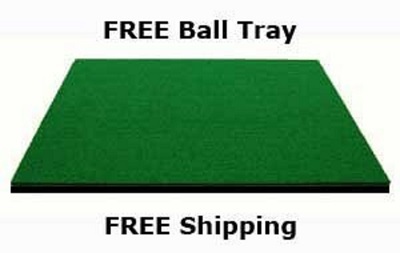 The Rukket Tri-Turf golf hitting mat comes with 25″ x 16″practice hitting mat along with nine practice balls and 12 practice tees made with different heights. The base is made from non-slip rubber that’s 2mm thick to ensure safety. The mat’s surface is made with high-quality synthetics to simulate the feel of real grass. There’s one 16mm turf to aid with working on your short game. The mat also has a 35mm rough and fairway turf. This versatile mat helps you work on your short game with its different surfaces as well as helping you minimize your strokes and average. The different height tees aid you in perfecting your shots no matter what the tee situation is on the golf course. 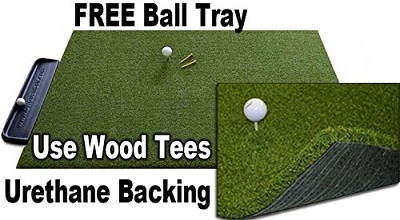 What’s more,the tees fit into the mat as if you’re plugging them into actual grass. You can set this up anywhere in your home, office or even your back yard. It’s portable & comes with all the equipment you need to perfect your golf game. The Dura-Pro golf practice mat is made from quality 100% nylon that is industrially bonded and thermally welded to ensure durability & stability. You also get two rubber tees and an adjustable tee holder, two tee holes & practice balls. Get the experience of a real golf course in the comfort of your own back yard with the Dura-Pro Plus. You’re able to work on perfecting your strikes anywhere from your own home to your holiday. The mat is light and portable enough to travel with. With all the added extra practice balls and tees, who needs to travel to a golf course when you already have everything you need? The Dura-Pro Plus is made from 100% nylon that’s knitted together so it won’t tear or break. With its UV protection surface, you’re able to play in the sun without the mat getting sun damage. This product comes with two rubber tees, an adjustable wooden tee holder and two tee holes for the left & right of the mat. Dura-Pro plus practice mats are suitable for indoor use to work on your short game and for outdoor use to work on those strikes. These mats are durable and light so you can travel with them and even put them through some rough handling. The Dura-Pro mats simulate the experience of a real golf course which aids you in practicing the correct way. You’re able to improve your technique anytime and anywhere. The PGM3660 3 Emerald mat is made from 100% nylon that’s woven to prevent wear and tear. The 5mm rubber base ensures no movement when you’re practicing. You get a 36″x8″x8″ turf and you get an extra rubber tee. Set the PGM3660 3 Emerald mat up in your back yard or office for the ultimate practice rounds. The high-quality mat provides a flat layout even on the bumpiest of surfaces allowing you to practice anywhere. The mat stays stationary with its integrated rubber base so you can move around easily without the fear of slipping. The Country Club Elite practice mat has a 5/8″ foam pad for stability and to ensure a flat surface. The surface is made from high-quality nylon fiber that’s two times denser than many others. 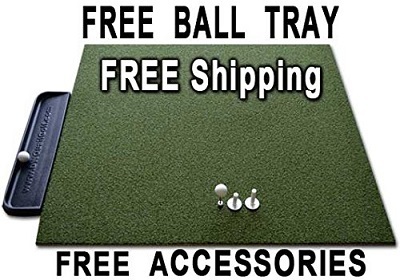 Practice your swing with any type of golf club with this practice mat. The material used to manufacture the Original Country Club Elite mat aids you in true-feel and realistic practice when you hit down on the ball. The mat also takes a real tee so you can get a good feel on your swing technique which rubber tees can’t give you. With its large surface area, you’re able to practice your shots using different angles. The Gorilla Perfect ReACTION practice mats are made from durable urethane backing with a 30% dense fiber turf that absorbs shock from iron clubs. The surface area is 3m x 5m and the backing is 1¼” thick. Get the experience of practicing with iron golf clubs with the Gorilla Perfect ReACTION practice mats. It absorbs shock and has no bounce which simulates the feel of areal turf. The thick non-slip backing ensures an even layout even on the most rugged surface areas. It also ensures your safety as the rubber keeps the mat stable as you move around on the mat. The HealPT practice golf mat is to simulate three different grass cuts namely fairway, tee box and rough. The mat is made with high-quality materials to ensure durability and the non-slip backing is for safety & stability. The surface area is 25″ x 16″ and you also get six bright yellow practice balls. This versatile practice mat allows you to work on three different types of surfaces to perfect your golf technique for all circumstances. The short cut allows you to hit directly off the turf and it allows you to plug in a real tee so you can have the experience of driving off a real tee box. The longer cut is to aid you in practicing hitting your ball out of the rough. Benefit from the clean-cutfairwaythat allows you to practice hitting with irons and hybrids. 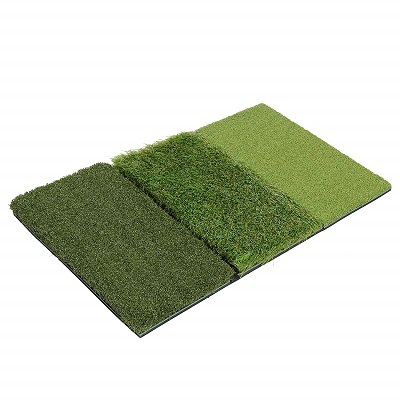 The Milliard practice mat is manufactured with three different height turfs. For stability and safety, the backing is made from thick rubberized EVA foam which also allows you to fold your mat easily for storage. The area of the mat is 25″ x 16″ and the backing is 2mm thick. Get the experience of playing on real grass such as bentgrass, fescues, Rye Grass, Kentucky bluegrass, smooth-stalked meadow grass and more with the Milliard 3-in-1 turf. You’re able to perfect your putt, chipping and drive anywhere you like as this mat is completely portable. The Motivo golf practice mat is made from high-quality material to ensure durability in all conditions. It has a 5/8″ shock pad that provides air and elasticity. This helps with stability when you play. The dimension of the mat is 3ft x 4ft and you get free foam practice balls. 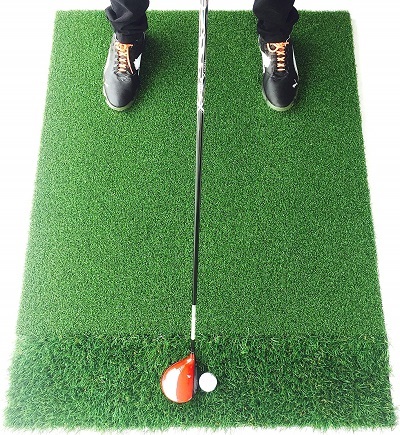 Practice anywhere without damaging a surface by placing a Motivo practice golf mat down. Play a round of golf with your friends in the office or simply practice in your back yard. You’re able to work on your strikes, short game and teeing off. The All Turf Super Tee golf mat is made from 100% spring crimped nylon for durability and the feel of real grass. For safety, the backing is made from non-slip urethane. All in all, this entire mat has a thickness of 1.250″ and the surface area is 48″ X 60″. 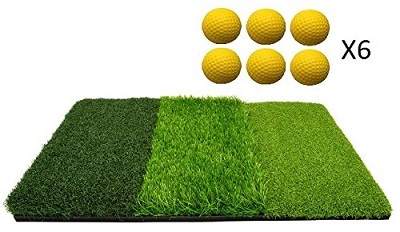 The All Turf Super Tee golf mat allows you to tee off on a mini golf course as it simulates real grass. Work on your short game, strikes, strokes and work on your aim anywhere as the mat is light & easy to travel with. The durable turf allows you to use irons and hybrids for your shots. To get the best practice results you need a quality mat with the right design to suit you. There are many mats on the market that are different shapes and sizes & made from different materials. 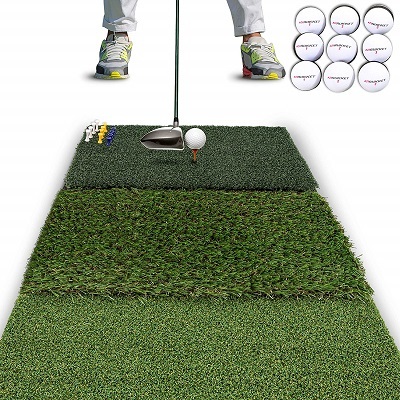 The mat you select can make a big impact on your golf performance. Remember that any sports equipment should be an investment so your practice mat should be durable enough to withstand any conditions. That’s why we recommend the 4′ x 5′ Dura-Pro Plus PREMIUM. It can be used by novice players as well as professionals as it’s versatile & easy to use. 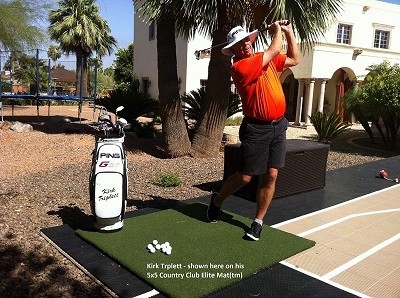 Turn yourself into a pro golfer and get a golf practice mat to practice anytime & anywhere. They’re inexpensive and they’ll make it easy to improve your golf game.